This saga is the first (written by L.E. not in the timeline of the universe) of the books set in the magical world of Order and Chaos magic welder. The story sees a young man, Lerris, sent out from the safe island of Recluce, where he just didn’t fit in with the total Order. The rest of the world lies in a grey area where powerful Chaos mages rule offsetting the Order of Recluce. This is the journey of understanding as Lerris earns more about the difference between White (Chaos) and Black (Order) magic and the mysterious and Grey magic. Lerris it turns out is a powerful Black magician who can also weld a mean Black staff… There is cause and effect (too much Chaos leads to more Order and vice-versa) so for the pure Order island of Recluce there must be an opposite pure Chaos. Lerris find himself having to restore some Order in the world of Chaos, but what will he loose because of that fight…? I have always been meaning to read more of Modesitt and really enjoyed the Imager series – he always seems to be able to come up with alternative magic and fantasy as a genre tends to have magic core to its heart. Recluce is true to that statement – the magic is very different and opposed to each other. Which creates a perfect platform for the traditional good v bad (order v chaos). OK – disclaimer here. I love this series. I also love the Spellsinger series. I also really liked the Corian books (Tim wasn't as keen though) Further I am a real fan of most of his his Sci-Fi stuff even though many are basically the same novel being re-written over decades in his quest for the perfect novel and expression of his ideas. The Recluse series is my favourite but the second book is the hardest to read because he is trying to give so much important background information for the rest of the series. The third book however is my favourite of the initial series but what I really liked where the later series (four series of 2 books on a single protagonist and one of 3 novels about the oringinal Angels). As you alluded to over the course of the sixteen novels, Modessitt jumps all over the timeline chronologically. Infact the first book that he wrote is actually one of the last, and the newest is one of the first. As with all his work, Recluse novels are basically an exploration of his academic work (he is an ethicist from Utah)and over the course of the books explore many aspects of all sides of the argument. My favourites are actually written from the white side or from those of the enemies of the Angels/Recluse. Just because Recluse represents order do not fall into the trap of thinking of them as the good guys. This is a series about all systems being flawed and nothing good remaining so for very long. Stick with the second book mate. Yes it is hard but it is full of important stuff so you can fully enjoy the rest. Also although they are some of his early work and not the best written, try his Ecolitan novels. The ideas are both confronting and intriguing. 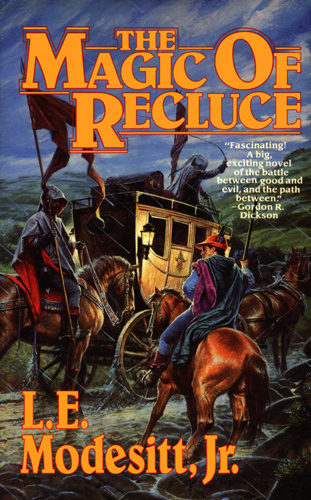 Thanks David… I do think that my enjoyment of the Magic of Recluce was effected by my starting the second book… I did enjoy it and originally thought to review the first few books together but as I struggled to get into the 2nd I thought it best to get the review over and done with! I'll push through and get into the third as I think that will get me back into the world I first enjoyed! This isn't a series or an author I have heard of.